7 of 12 (58%) reviewers would recommend this product to a friend. The PetSafe PDT00-13410 Deluxe Little Dog Training Collar is perfect for training your small dog around the yard. It is designed for companion pets 8 pounds and up and recommended for pets 40 lbs or less and up that are at least 6 months old. With its range of up to 100 yards, this deluxe little-dog trainer offers 10 adjustable levels of stimulation, from 400 volts to 6000 volts, that can be changed with a quick flick of the thumb, ensuring the appropriate stimulus, just enough to get the dog's attention. The unit's transmitter provides a negative tone without correction and a negative tone with correction. After a few corrections with the tone, the pet then associates the tone with the correction, making it one of the most humane trainers available. 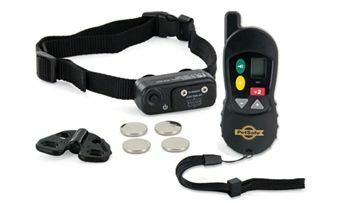 The 3-1/2-ounce transmitter features a correction dial and a red indicator light on its face, and a pop-off battery cover and belt clip on the back. The 2-ounce receiver features a power push button, a light on the side, an antenna running through the strap, and a red light that serves as a low-battery indicator. The transmitter is water-resistant, while the receiver collar is totally waterproof, so there's no risk of damage if the dog decides to go for a swim. Effective for Pets between 8-40 lbs. PetSafe has a Lifetime Warranty on parts and one year on labor. PetSafe guarantees all parts of this product for life against manufacturing or parts defects. Misuse or incorrect handling is not covered. If your unit cannot be repaired, PetSafe may replace it with new or reconditioned merchandise. PetSafe will not pay for loss of time, inconvenience, loss of use of your product, or its failure to work, or any incidental or consequential damages. There is a nominal labor charge for out of warranty products but all parts are free during the warranty period. If you have had your system for more than one year, call customer service at 1-800-732-2677 to determine the labor charge. Click here - PetSafe Little Dog Remote Trainer Owner's Manual. Summary:This collar is a lifesaver. I own a 3 year old Lab and he is very hard-headed. He has a mind of his own and doesn’t do anything I tell him to unless he wants to. So I just end up doing nothing and letting him do what he wants. He was completely out of control. Good thing I found the PetSafe collar and after only 2 days of training, I immediately saw an improvement. The collar has completely changed our dog. And it has saved us from a whole lot of trouble. My problem before is that I couldn’t control him at home. But now, I can even take him out for a walk without a leash! That’s a great leap for us, don’t you think?! And when we are out, we get a lot of compliments since he doesn’t pull me around anymore, he doesn’t jump on everybody and he doesn’t bark at anyone. And all this with just a few days of training with the collar. Summary:My dog used to jump up to anyone he sees but now, that problem has disappeared thanks to PetSafe Little Dog Remote Trainer. We have only been using this collar for 3 weeks and the results are astounding! I couldn’t believe how obedient my dog has become. He has been listening very well to my every command. I’ve only used the stimulation button on him once and that was enough for him. After that, I’ve only used the sound button but only occasionally since he has been very obedient ever since. This is a great training tool and the price is very reasonable. Thank you PetSafe. I’m recommending this to my family and friends. Summary:The good thing about PDT00-13410 is that it works fast. Our dog was quite the barker. He would bark at all our neighbors and all the dogs that pass by our house. It was becoming very annoying both for us and for our neighbors. When we finally got this product, it changed our dog. We only use the beep button since it was more than enough to stop our dog from barking. I’ve used static bark collars before and this collar is way better. It has different correction levels that you can choose from. This product has also allowed us to take our dog in public without having to worry about him barking non-stop. I would definitely buy another one if I have to. This product is amazing! Summary:PDT00-13410 is the one we have been looking for. We have tried everything we could to teach our dog some basic commands but our dog seems to have a mind of her own. She is very stubborn. She doesn’t listen even if I’ve been screaming at her for God knows how long. When we finally got this product, it was like I have a completely different dog. She has changed completely. This remote trainer was just what we needed to teach her to be obedient. This product is very effective. I wish I have gotten it sooner. It is also great that it has a lot of intensity levels that you can choose from depending on how stubborn your dog is. This collar worked like a charm. Summary:I love that there are a lot of stimulation levels that you could choose from in this product. My dog is quite the sensitive one so the lowest setting is enough for her. It easily stops her in her tracks. She is quite stubborn that’s why I decided to buy this collar. My biggest problem with her was with her barking. She barked a lot and nothing else had helped me teach her to stop barking. All the other collars didn’t work on her. I’ve tried citronella collars and regular bark collars but they didn’t stop her from barking. This collar finally trained her. This is a great tool if you want your dog to stop barking. I just wish the range was a bit longer. When we go out, the range sometimes falls short. But other than that, this collar is great. I would still recommend this.